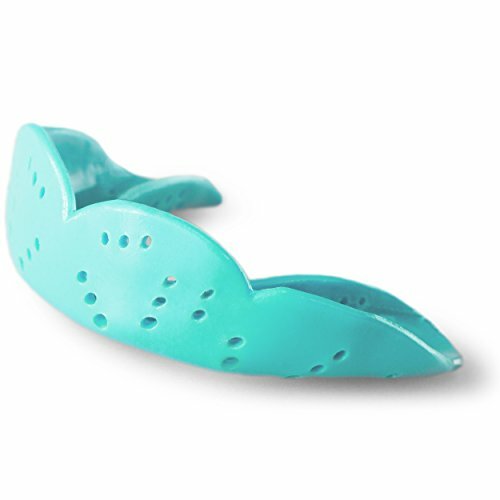 The SISU Aero NextGen Mouth Guard offers more protection with less mouth guard. The Aero NextGen is designed to fit players age 11 and up, including adults, and is ideal for football, hockey, lacrosse, basketball, boxing and other contact team sports. SISU’s NextGen models feature improvements over the original that include a wider bite pad, rounded edges for comfort and improved mold-ability to ensure a perfect fit. All SISU guards can be quickly and easily molded (and re-molded) to the individual user at home with hot water. At only 1.6mm thick, or 50% thinner than conventional, bulky mouth guards, players wearing the super slim SISU Aero NextGen can talk, breathe and hydrate normally with the guard in-place. With SISU guards, superior comfort does not mean sacrificing protection. The SISU Aero NextGen is scientifically engineered with Diffusix technology, which uses a non-compressible, perforated material to distribute impact forces over a larger area and reduce risk of dental injury during competition. SISU guards are compatible with braces, but a dental professional should be consulted for proper fitting (adult-sized guard recommended for all ages wearing braces). For younger athletes, look for the SISU Junior NextGen. For adults playing high-impact sports, check out the SISU Max NextGen for maximum protection. SISU mouth guards are backed by a $35,000, one year limited dental warranty protection. Guard is free of BPA, PVC, phthalates, and latex. Made in the USA. If you have any questions about this product by SISU, contact us by completing and submitting the form below. If you are looking for a specif part number, please include it with your message.